From California Health Report: “The impact of stress and trauma on people’s physical and mental health looks set to become a central focus of Gov. Gavin Newsom’s administration in the wake of his appointment of the state’s first surgeon general. This week, Gov. Newsom tapped Nadine Burke Harris to fill the newly created position. Burke Harris is a physician and pioneering leader in the field of toxic stress and health. 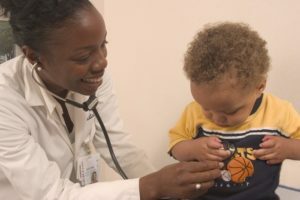 She founded the San Francisco-based Center for Youth Wellness, an organization that’s working with pediatric clinics nationwide to develop best practices for screening and treating children at risk for toxic stress. She will be sworn in Feb 11. […] In a press release from the Center for Youth Wellness, she praised the governor’s commitment to tackling health issues through the lens of childhood adversity.